Last night Andy, Kevin, Stuart and I went to see Hedwig and the Angry Inch at the Belsaco Theatre in New York's glitzy Broadway. Starring Taye Diggs the show - well, more of a concert than a show really - told the story of Hedwig's journey from man to woman, from Germany to America and from shy introvert to blazing rock star. 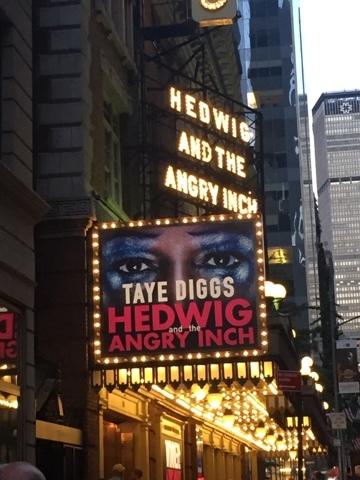 Good though the production was Diggs was perhaps 'playing' Hedwig rather then 'being' her. The constant breaking of the fourth (and fifth?) wall with trans jokes, gay jokes, black jokes, and Broadway jokes meant we were never really immersed in her character. The audience lapped in up though with constant whopping and applause. The band was tight and the singing clear so there was much to enjoy with highlights being the rollicking Sugar Daddy and wonderful Midnight Radio. I wonder if a West End would work?